One thing that always annoys me about home before/afters (or indeed weight loss or fashion before/afters), is that the 'before' photos tend to be amateur, badly lit, unflatteringly angled shots, while the 'after' pics are professionally perfect. That's not AT ALL what I've done here. Oh no. I lie. That's EXACTLY what I've done here, thanks to Susie Lowe's fab 'after' shots. But although the pictures exaggerate the effect in some respects, spending time/a penny in the After-Bathroom is a drastically different experience from the Before. This is our family bathroom (we have a separate shower room in the basement), which needs to accommodate me, the Pink House Husband, and the two floor-splashers AKA the 3yo and 6yo Pink House Dwellers. So we needed to get the revamp right. To better convey the radical difference between the Before and After experiences, here are 5 ways in which my After-Bathroom has transformed my - and my family's - lives, plus where I bought stuff and what I learned from the experience. There's something about using great quality, natural materials (brass, marble, ceramics) that gives me a sense of enormous wellbeing. And then I'm happy for the rest of the day, safe in the knowledge...sorry. Anyway, the point is that when it comes to home renovation I reckon it's worth investing in the basics, as they lift the look of a room in a way no accessory ever could. Not even a Tom Dixon copper candle. One of the Before-Bathroom's practical problems was the lack of shower - the ceiling slopes, so there's not enough space to stand in the bath. Yes, we have a shower room, but that's two flights down from my bedroom, and I didn't love being surprised by the supermarket delivery man in nothing but a flimsy towel. But I went to the shower room anyway, because, well, I wanted a shower. But while planning the new bathroom a thought occurred to me: who says you have to stand up in the shower? So now we have a lovely brass Barber Wilsons sit-down shower. And you know what? It's excellent for shaving your legs (sitting = easy leg access) and dyeing your hair pink (just put the plug in to let the water accumulate, sit in the cosy bath for 15 mins while the dye does its thing, turn on the shower to rinse it off). Now, thanks to the sit-down shower I often use the After-Bathroom, and rarely encounter random men while half-naked in my hallway, though some might argue this isn't necessarily a benefit. Before, the bath was extra-narrow, leading to frequent complaints from the man-sized Pink House Husband about not being able to fit his full manly width into it comfortably. Now, because we stripped the bathroom right back to the brick wall (see pic, right), we are able to squeeze the bath further in to the brick, and therefore have a bit more space for a normal-sized tub. So the man-whinging has stopped, which is good. One down side to the bath tap now sticking out the wall where it does, is that the kids bang their heads on it fairly frequently. But that's not only character building, but also a ridiculously first-world problem (Mummeeee! I bumped my head on the shiny gold tap and got Elemis shower gel in my eeeeeeye!) so they can just deal. When you put this much effort (yes, and cold hard cash - I'm not going to lie; those taps weren't cheap) into a room, it makes you raise your style game. Out went the manky towels, in came a fresh load of fluffies from The White Company. Out went the random mishmash of bottles I've collected at various magazines' beauty sales over the years, in came a truckload of pretty Elemis products. Oh, and the Diptyque candle. Obviously. So now when I'm lying in the bath, it's like I'm in a tiny, gorgeous spa: I'm gazing up at gold fish swimming through soft, subtle lighting, I'm smelling the sweet scent of Baies, and I've locked the door against tiny intruders. It's basically the dream. OK, these are mainly ways the bathroom has changed MY life - not sure how much the kids have benefited (other than aforementioned character building). But hey, if mum's happy, kids are happy, right? 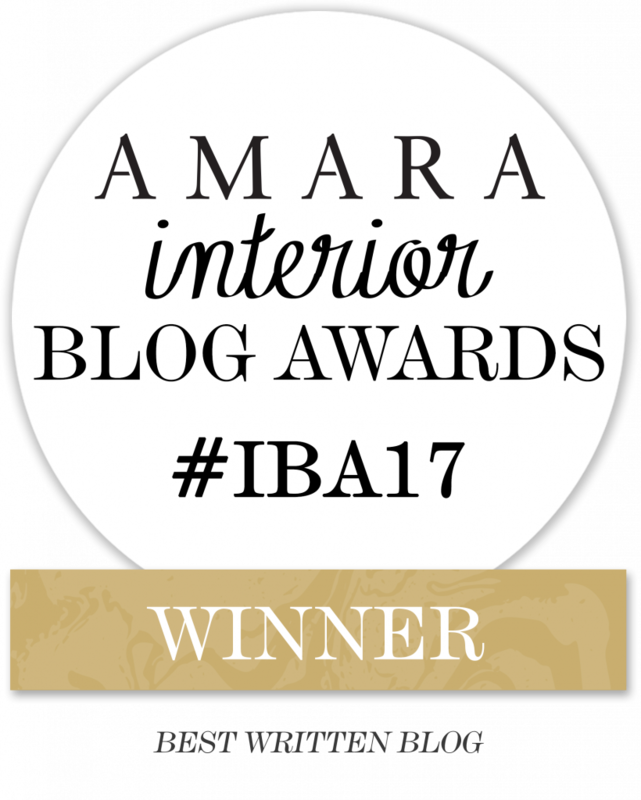 If you enjoyed that post, or even if you're just in a giving mood, please would you take literally 10 seconds to click HERE and vote for The Pink House in the 2017 Amara Interior Blog Awards where we've been nominated for Best Colour Inspiration. Thank you!